I am part Irish on my mother’s side. 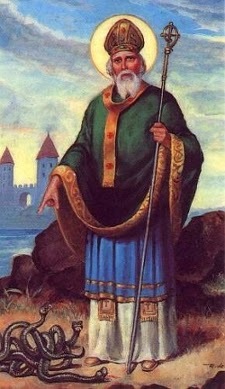 I have always celebrated St. Patrick’s Day and when we were younger we used to have or go to St. Patrick’s Day parties. We even attended a parade or two when our kids were little. I even had a collection of St. Patrick’s Day decorations, sadly they had been untouched for years. I just didn’t get them out in time. It’s just not as much fun to decorate without children at home. I do have a table topper and table runner I made after I learned how to quilt which I keep on one of my quilt racks so I put them out. It’s funny how things change when your children grow up. I used to decorate each month of the year differently. My kids loved it. When they grew up and left home I barely remembered that a holiday was coming except for the big ones that is. It has gotten better since I have three grandchildren and they have moved closer to me. Now when they come over and I have some seasonal/holiday decorations out, they really like it. It’s definitely true that grandchildren make the world a nicer place. They bring such joy into your life. They can be spoiled and sent home for mom and dad to worry about the discipline and homework and all that that entails. I just get to love them and enjoy them. The best of two worlds.